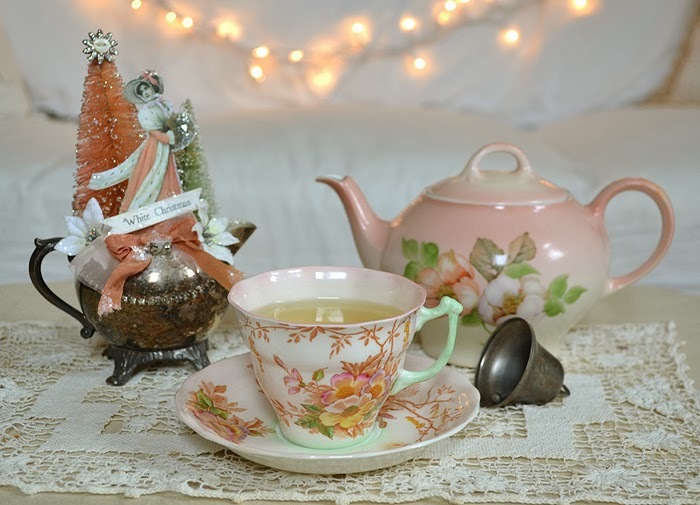 Artful Affirmations: Tea Cup Tuesday-Happy December! 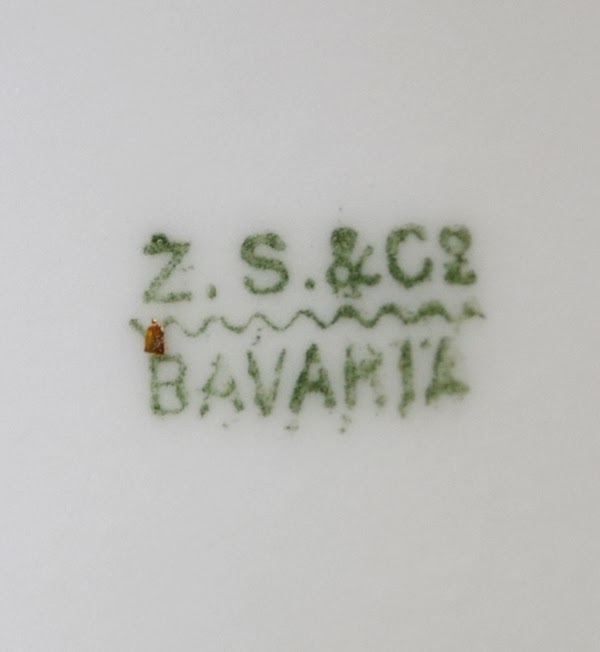 The Bavarian teapot is gorgeous! Everything is beautiful. Thank you for the party. Have a lovely December. Terri of all the things you have made with that sweet image it's hard to decide which I love best...but I think today's is my favorite...I love the non-traditional colors! I have set all my Christmas tea cup sets out. I am currently favoring Lady Earl Gray as my go to tea! Have a lovely evening! I like the green handle on your teacup and the teapot is pretty. 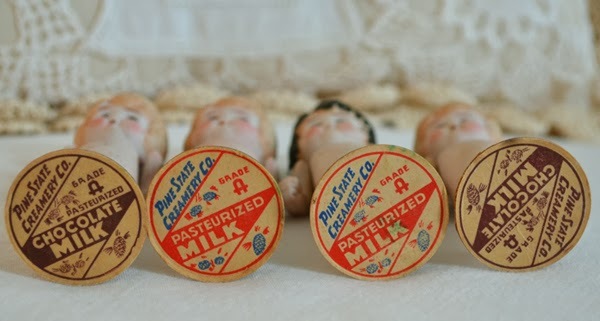 I've never seen the dolls before but do remember the cardboard tabs from the milk bottles. Your little vignette in the first picture is adorable! I love how you laid the bell in the scene and your creamer creation is just lovely! I haven't seen the little dolls they are so neat! Hi Terri. I love your White Christmas arrangement! So cute! And of course I love your teacup! Thanks for hosting and have a great week! Such a pretty setting! I especially love the colors and your little vignette. I have one of the little dolls that belonged to my grandmother. Thank you for sharing the information about these. The milk tab is no longer attached, but I'm happy to know a bit about its origins. and tea pot - just made for each other. The colours are so delicate. Your newest creation using your little tarnished creamer turned out beautifully. It is so sparkly! I must get into some sparkles I think or even some tinsel edging if I can find some. Hope you are going well dear friend - thinking of you as you sip that Chammomile tea! Your tea vignette is so pretty. I love Christmas decorations and they do perk up a tea tray too, don't they? Those little dolls are so cute! Thank you for sharing and have a beautiful week. Oh, Teri ~~ I especially love the pink and green "assemblage"....so unique and vintage looking! And the little Milk Tab Dolls....how cute! I've never seen or heard of them! Happy Tea Cup Tuesday! 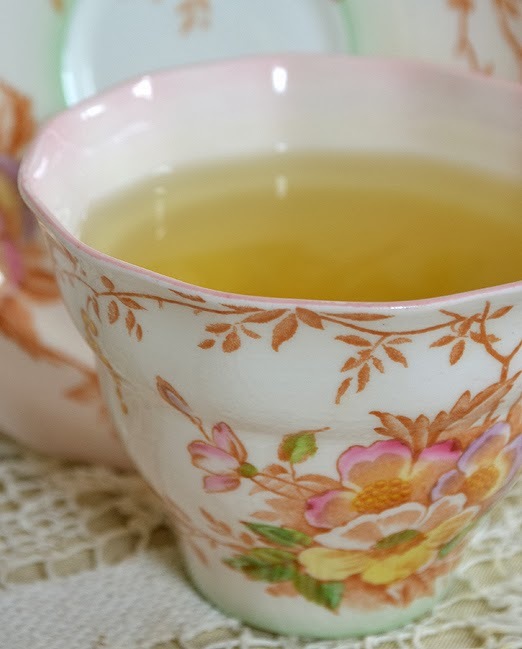 that cup and teapot, are just so beautiful, I love that style, -AND your amazing display in the silver creamer- oh how magic my dear , just love it. I also never saw such dolls, but I> congratulate you with the wonderful find, you will have such fun with them!! 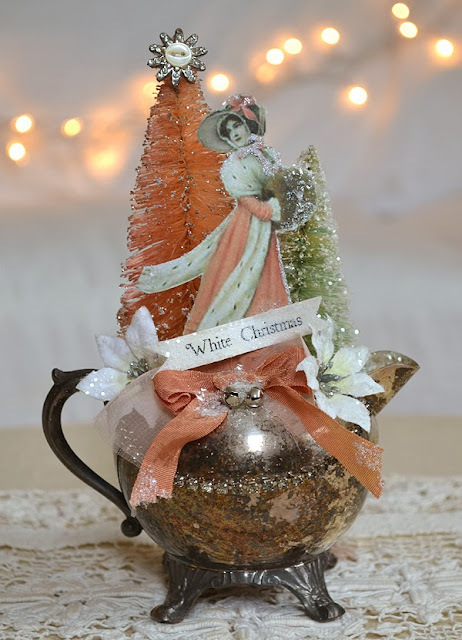 Wow..so very magical Terri..what a gorgeous and enchanting tea post...love all the little figurines..very unique..wonderful festive shots and I love your artistic creations always..beautiful and elegant! Oh, Terri! What a great post! Your teacup almost made me think Shelley - love that handle, too - but your upcycled silver creamer with the bottle brush trees and vintage lady is gasp worthy! Just love it!! Now - the ild tab dolls?? Never heard of them but how wonderful you have discovered them to share with us! I will keep a look out. I've seen little bisque dolls like that, without the milk tab. I will have to chat with some elder citizens to see if they remember them. I only remember the cardboard tabs - and getting our milk deliveries. Would have loved a doll, too! This is a beautiful post, Terri. I love the beautiful creamer art and of course, dolls are my favorite things. The little dolls are wonderful and I've seen many of this type of doll in my travels, but never with milk tabs on them and so I never knew about Milk Tab dolls! Thank you. 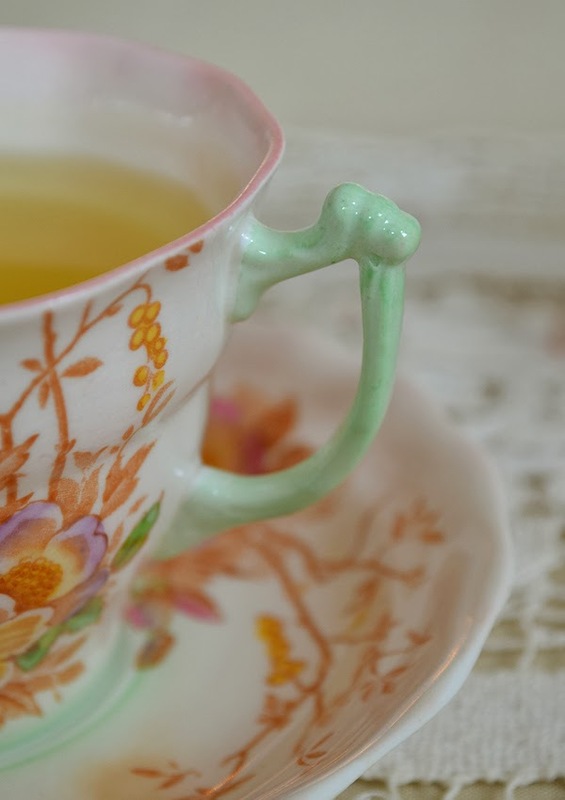 Of course your teacup is beautiful and you have inspired me to have a cup of chamomile tea right now. Also, I love almost anything Bavarian. what a sweet tea vignette your ccreated. 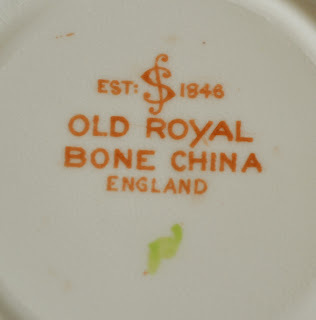 Your china is as always exquisite, but the little assemblage in a silver creamer is really lovely. We don't had those cute milk tab dolls, but we had small plastic figurine, which came as a bonus from a certain magarine. They are collectors fun today. Thank you for sharing this interesting post and for hosting this sweet event. Milk tab dolls! They are adorable! I love that cup. The colors are so pretty together. It's totally charming! Oh your teatime is so beautiful, Terri!!! And those milk tab dolls are DARLING! Oh you will have such fun with them! Your creamer creation is lovely and the perfect lil center piece for any teatime in December. 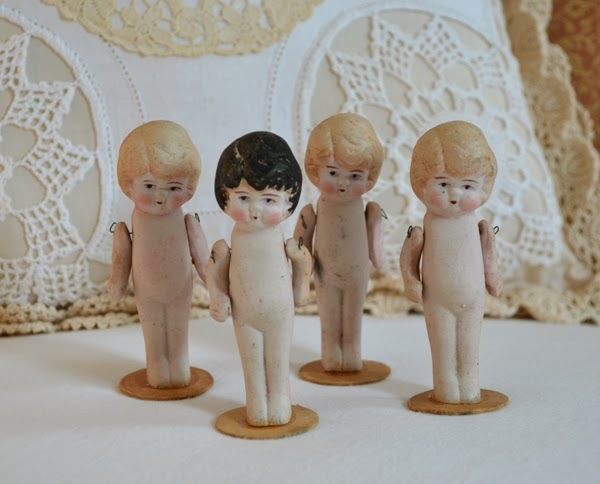 I have never heard of Milk tab dolls and I'm old myself..hehe They are adorable and my own muse is whispering some ideas so I know yours must really be. I think next week I will try and join in the tea party...I LOVE them!!! It is a pretty teacup and I like your description too, because the color combinations in this cup & saucer are a surprise, a lovely one. Your little silver creamer "bouquet" is so lovely. ( I wish I could come up with better words than "lovely " , "beautiful", etc., but these words are perfect for so many things you post Terri ! I have seen those dolls before, I used to see them all the time when I was younger but can't say for sure where. I imagine you'll be coming up with some very creative ways to use them too. Thank-you again for hosting this tea -time . what a sweet and elegant setting Terri-I adore the festive teapot!! 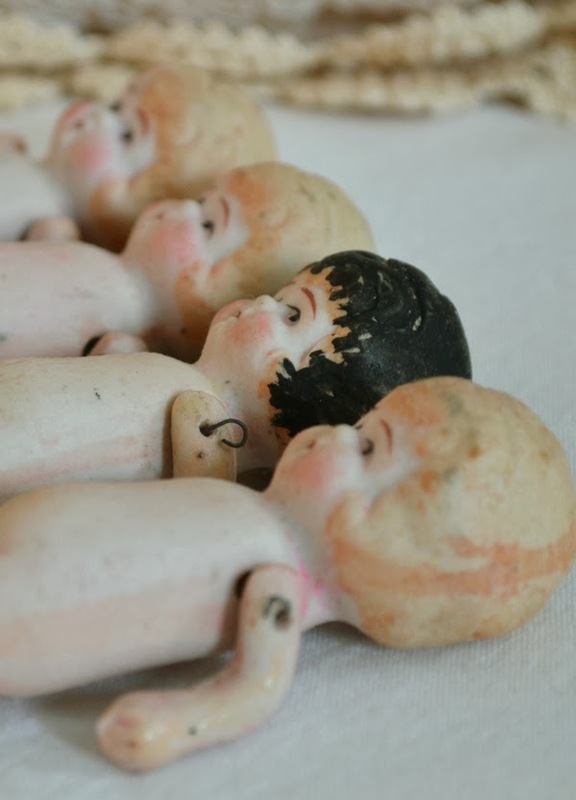 Never heard of the milk cap dolls-what a lucky find! Not sure I'll get to join you until after Christmas but I always enjoy my Tuesday visits. Oh wow Terri, your creation is so beautiful , I just LOVE it, in the creamer! 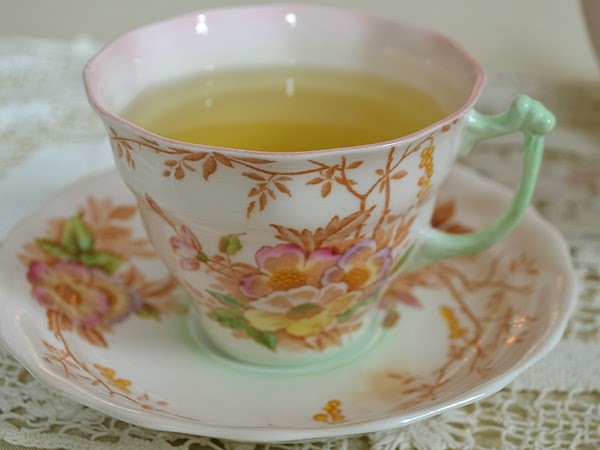 And the teacup today is just another big WOW with that green handle, so unusual and sp pretty, I love it! Thinking of you every day sweet friend, will be talking soon. Big hugs! Oh goodness! That teacup with the green handle is gorgeous. Such a lovely shade of green. The Milk Tab dolls are fascinating! I've never heard of them - I'll have to do some research! Dear Terri, I just wanted to send along some wishes for a very Merry Christmas and a Happy New Year!